We just got done detailing why, in spite of the requisite musical components and enthusiasm of the singer and band, the results of Big John Greer’s attempts at competing with the more authentic rockin’ efforts of Stick McGhee and Wynonie Harris, the originator of Drinkin’ Wine Spo-Dee-O-Dee in the case of the former and the owner of a more appropriate cover version that went Top Five in the case of the latter, were probably bound to be in vain. It’s not that Greer wasn’t willing to rock, it’s not even that he wasn’t technically able to rock, he certainly was, but it’s just that he wasn’t quite as suited for rocking constitutionally. Yet that didn’t stop him – or rather it didn’t stop record companies from seeing in him a person who could reasonably be presented as a rock artist without drawing too many charges of impersonation or fraud in the process. Because of Greer’s slightly higher class musical background it allowed a major label, in this case RCA, to maintain their hypocritical standards of decency and yet still gave them the opportunity to score some hits in the field themselves. So poor John Greer, an unassuming sort who was a good sax player and decent singer for Lucky Millinder’s outfit, found himself slapped with the Big John Greer tag (not to mention getting his cohorts dubbed The Rhythm Rockers, just so there was no mistaking what they were playing) and told to convincingly embody a rock artist without getting TOO carried away with it. All things considered he carried off those conflicting demands pretty well over the years even if he was always at risk for being the one artist standing in line at the rock clubs who’d get the door ignominiously slammed in his face by a bouncer less willing to accept his uneasy compromises than we are. But even for us somebody has to be the last one let in that door and in John Greer we have that someone. Though the entire focus of Spontaneous Lunacy is rock music’s history, no side roads or detours along the way – at least in the records we review – the history of ANYTHING can’t be fully told without talking a little about the context of the time and the precedents that came before it. Most of the full-fledged musical genres in the recorded music era have had their histories told, their parameters defined, their impact assessed and their influence noted in reasonable fashion over the years. You can find excellent information of the blues for instance. There are jazz scholars who can break down the art form historically in precise detail. Gospel has some excellent books that have been written on the subject. The one notable exception however is a style of crucial importance – very popular though somewhat short lived, extremely influential yet rarely referred to, possessing big name stars but without a genre name to collectively brand the type of music itself for the public’s recognition – which is the immediate predecessor of rock. The murky undefined netherworld of 1942-1947 black popular music. Descended from jazz and featuring the remnants of slimmed down big bands, yet not as classy or technically advanced as either, I’ve referred to this musical period as “transitional” music, which is about as bad a genre name as you could come up with unless you called it “Harold”, yet nevertheless perfectly describes what the music represented… the transition from jazz to rock, connected to both yet belonging to neither. Lucky Millinder was a member of that fraternity. A bandleader of one of the most talented aggregations of musicians the world had seen featuring more big name instrumentalists over the years than you could shake a stick at, they enjoyed a long run of popularity with music that has been largely excluded from the history books of ANY style. Too watered down for the taste of jazz snobs but not raunchy enough for the rock historian to find much use for, their role in shaping the music from one era to the next was formidable yet their reward for that task was to be shunned from both eras. Millinder’s crew had four #1 hits between 1942-45 but their output during their prime was somewhat limited due to the lengthy recording ban spanning those years which prevented all bands from putting down their best ideas on record when still fresh and cutting edge, in the process robbing them of even more hits with which to put their accomplishments in better historical perspective. As a result their reputation rests largely on the strength of their live shows from that time but once those fans died off their music faded from consciousness and with no one to champion their work they barely made any history books aside from small print footnotes. The sad fact of the matter is few writers sought the testimonials of black listeners of the 1940’s who’d be most likely to recall their impact, whereas jazz always had white listeners to wax poetic about it, while a huge influx of young white archivists in the 1960’s and beyond dug up any information, no matter how obscure, on the same era in blues. So Millinder, along with Joe Liggins, Roy Milton and even the great Louis Jordan who was the dominant figure in that movement, have all seen their legacies fade away in time. Transcendent artists without an enduring stylistic home to call their own. John Greer had been one of the final recruits to Millinder’s band just before rock made Lucky’s place in the music world increasingly irrelevant. Drafted to replace Bull Moose Jackson, a similar looking and sounding sax playing vocalist who’d found success as a solo artist, Greer soon found himself pulled out of Millinder’s ranks for the same purpose – as a potential hitmaker as a solo act. Except now, unlike what Bull Moose had been called on to deliver (that aforementioned transitional style) the music with which to get those hits was rock ‘n’ roll and so that was the direction Greer headed, or was steered into. He even had the name Big John slapped on him to remove any doubt regarding his musical allegiance. Yet all the while he continued playing with Millinder as well where he was asked to carry off more refined music. Then he’d simply turn around and dig deeper on his own rock sides to try and deliver something a little dirtier. 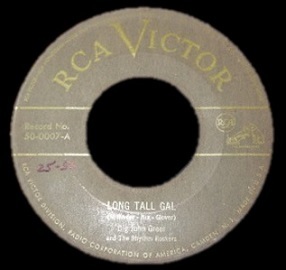 As you can expect it made for a rather split-personality and here on Long Tall Gal – a song written by Lucky no less – we get to see the divide in eras and styles and the musical mindsets that accompany them. Though RCA certainly were interested in exploring the outer fringes of rock ‘n’ roll for the sheer commercial potential it already exhibited, they weren’t exactly excited about contributing to the noise and perhaps in the process dragging music as a whole further into the gutter. Which is why in Big John Greer they had the perfect man to offer up as their designated rock artist. It’s no surprise that Greer was practically the only act on their payroll between rock’s birth in 1947 and the arrival of Elvis Presley on the label at the dawn of 1956 who consistently released records that could be housed under the rock banner. Yet very few of those records were anywhere near the front of the line when it came to the extremes that would define rock’s progress. Long Tall Gal might be at the back of that line because this one barely qualifies as rock ‘n’ roll. About eighty percent of the song anyway – in the way it’s written, arranged and performed – has no business in a review of rock history. Those components actually provide a pretty good example of that “transitional” style that Millinder helped to define over the past seven years or so which was now long past its expiration date, at least when it came to setting the pace for advancement in the black musical community. The vocals here are not just conspicuous in their presence but are brashly unaware of the scorn they’re drawing from rock’s gatekeepers as they try to come waltzing in the door singing lustily in unison like some cockeyed parade around the bandstand at a club where Dom Pérignon is being served rather than the rotgut liquor that is the most popular drink at the rock roadhouses. It’s not that they’re singing in a dainty way mind you, but rather they’re singing in a way is entirely inappropriate for any self-respecting rocker to feel comfortable being within a hundred miles of. They clearly don’t understand the rock attitude which demands a certain amount of reserved suspicion on one hand, and drunken revelry on the other. These guys completely ignore the first of those, which is fine I suppose, not all songs need to project hardened glares to qualify for rock, but in focusing on the other aspect, the party-atmosphere, they’re utterly clueless about the way in which to do so. They’re substituting broad smiles for sly grins, bouncy cheerfulness for raunchy excitement, offering up a sanitized brand of musical exuberance without any compelling underlying motivation to make it sound authentic. Even Greer is effected by this milder approach, removing any hint of leering that the lyrics – about the attributes of the girl spoken of in the title – call for. He comes across like a bad actor in an amateur play, presenting a façade meant to suggest emotions that he’s incapable of fully understanding or embodying convincingly when he opens his mouth. Their spry sing-along is so artificial in this setting that it sinks all of the lyrics, which while not great would at least be moderately evocative in other hands. Instead they’re using a neutered brand of jovial happiness in place of an unbridled form of horny anticipation and if there’s one thing rock can’t stand it’s an inexperienced ladies man trying to convince others he’s got some notches on his bedpost. So by now you must be asking why we bothered including this Long Tall Gal in our line up of rock centerfolds at all, other than to delve into the oft-overlooked part Millinder himself played in paving the way for its offspring that eventually became legitimate rock ‘n’ roll. Well earlier we said that eighty percent of this was awful and that’s the part we’ve just torn to shreds in the review. Now comes the part we’re gonna praise without reservation, the completely unexpected arrival of the rock ‘n’ roll cavalry in the form of the musicians backing them on this. Dubbed The Rhythm Rockers they live up to their name and then some in the scorching hot mid-song instrumental break! The music playing behind the vocals was unobtrusive and not particularly noteworthy. It wasn’t ill-suited exactly but it was simply nothing to really take notice of. They were keeping the pace, hitting the right notes and trying not to be implicated by the crimes committed against rock’s good name that were happening elsewhere in the song any time someone opened their mouth to sing. But then, maybe getting as fed up with the singing as we were, the band heads into the break like they busted out of prison with a posse on their trail and none of them were reluctant to start firing back as the chase got underway. We’re met with the hottest drum break yet found in rock, a brief but blistering assault that leaves the skins bruised and our hearts racing. Then, as if that wasn’t enough to get our attention, Greer jumps in with a sax solo that doubles down on the bet, not quite taking its place alongside the McNeelys, Singers and Moores who’ve turned the tenor into a weapon of mass destruction, but certainly played with the same basic intent – to get you moving, grooving and shedding articles of clothing as you writhe in passion. Sadly he’s interrupted by the dreaded massed horn section that we thought we’d escaped from but luckily they don’t last too long before the tenor returns. At that point we’re no longer going to be surprised by anything, unless they detonate the instruments with TNT, but we’re at least relieved that they consented to let the musicians cut loose momentarily and drag this record – kicking and screaming and clutching the doorframe in protest perhaps – into the outskirts of the rock territory. Now the question becomes how much does that all too brief interlude rescue this? Honestly, not nearly enough. It’s what got the record INTO the party, but once inside the rest of the song’s attributes will factor more heavily into how it’s received and clearly most of it is not going to be received well at all. But that won’t stop us from letting it sit in the corner, waiting for its chance to break loose of the past. Maybe just being in the place and seeing everybody else acting up will get them to realize what it takes to be welcomed there and they’ll start to display what they were all clearly capable of in the right frame of mind. So while they don’t offer much over the course of the full record, what they do come up with in a quick burst of musical aptitude is just enough to avoid our complete derision for crashing our rowdy party. I’ve seen this non-rock mixture of swing and blues that was popular during the 40s referred to as “jump blues,” “swing blues,” and “rhythm and blues.” I’ve more-or-less settled on jump blues because (1) the music of Louis Jordan, Lionel Hampton, Julia Lee, etc. isn’t generally accepted among jazz circles thus making “swing blues” a something of a misnomer and (2) the term rhythm and blues (aka R&B) is borderline meaningless at this point and is usually used to mean “black music that’s not rap.” With all that said, jump blues isn’t perfect either. Too many writers love to label the work of Wynonie, Roy, Amos, etc. as jump blues. Still, I guess that’s the best we have to work with. Long side-note: What does rhythm and blues even mean? From what I understand, R&B was used during the late 40s/early 50s as a catch-all term for non-jazz black music. It somewhat fell out of favor for rock-and-roll during the rock’s earliest crossover years (roughly ’55 to ’58). Then, during the mid-60s, British bands started calling their music R&B. By this point, black music was dubbed soul (and later funk). The 80s nonsensically brought back the term R&B and we’ve been thoughtlessly using it ever since. Does R&B describe a genre/subgenre? If so, is it under the umbrella of rock-and-roll or is it separate? Opposing general thought, soul, funk, disco, etc. are forms of rock, but way too many writers like to claim otherwise and slot them under “R&B.” Seriously, I have seen the term used to remove mostly black artists from rock-and-roll. Google “Fats Domino” and count how many articles “clarified” that he wasn’t rock, but instead rhythm and blues following his unfortunate passing. This has also happened to James Brown, Ruth Brown, and the Clovers, etc. Rhythm & blues is simply a catch all term to signify what black listeners were/are buying that then was intentionally misappropriated by others to segregate music itself solely on the race of the performer. Think of it this way: If Billboard magazine had instead come out with a FEMALE AUDIENCE chart to determine what women were listening to for purposes of sales and marketing it’d have obviously included lots of male artists. After all women loved Frank Sinatra, Sonny Til, Elvis Presley and Luther Vandross every bit as much, if not more, than male listeners did and the chart would reflect that. But then along the way if people decided to use it merely to classify all women ARTISTS it would’ve distorted the entire premise. It would no longer reflect Female Listener habits as intended, but rather be used as a crude and repugnant form of gender segregation. Well, that’s what happened with R&B. But in truth it’s a chart term, nothing more. Thank you; that was a perfect explanation. I will say that I think I like the term “R&B” a little more when I think of it as just a chart term and nothing more. 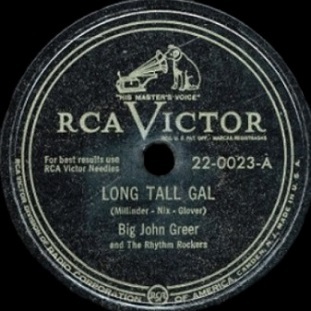 Leave a reply on "Big John Greer: “Long Tall Gal”"